Carbon dioxide is all around us and constantly in flux. It’s released naturally through decomposition, ocean release, volcanos, and respiration. Obviously, human activities such as deforestation and the burning of fossil fuels for energy also contribute. Because CO2 is invisible to the human eye, people often struggle to visualise the impact and movement of emissions, but a few years ago NASA created some incredible new computer modeling to give scientists (and us!) 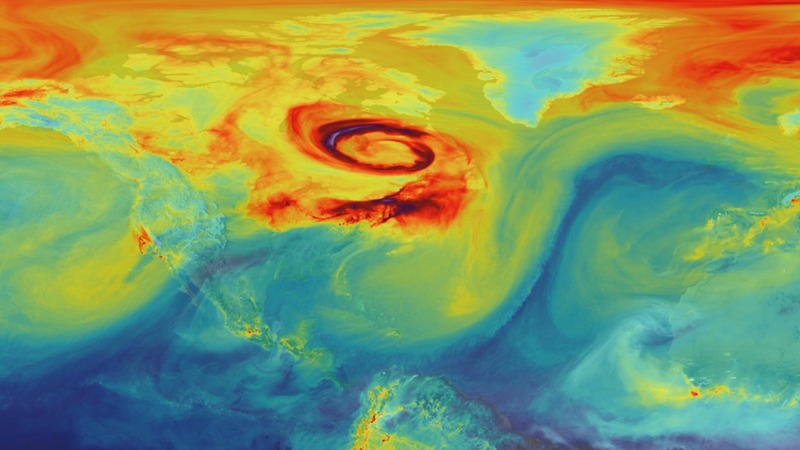 a stunning vision of how carbon dioxide in the atmosphere moves. Using a simulation called a “Nature Run”, real data on atmospheric conditions, greenhouse gas emissions and both natural and man-made particulates is pulled in to simulate the natural behavior of the Earth’s atmosphere. The original Nature Run simulates January 2006 through December 2006 but an improved version was released in 2014. Check out the beautiful and somewhat trippy simulation clips over at NASA.